Agincourt is likely to have enjoyed both, the buying and selling of things and, perhaps, even the making of them. Many of these activities would have been manifest in the CBD, the four blocks of Broad Street and the few lots east and west on the avenues. Now and then I run across examples of commercial fronts (like the auto dealership posted a few weeks ago) and glom onto them simply because they’re so iconic or curious or some other eye-catching justification. Such is the case with this not-so-clear photograph of Benson, Minnesota, and its auto garage in the heart of the community’s “Main Street”. The jaunty brick-and-stucco material palette puts the building some time about WWI I should think. In the early years of the automobile, it was often treated as both status symbol and source of potential disaster. Recall that the internal combustion engine and the fuel that ran it could, and often did, explode with serious consequence. Hence the detachment of the garage from the house. 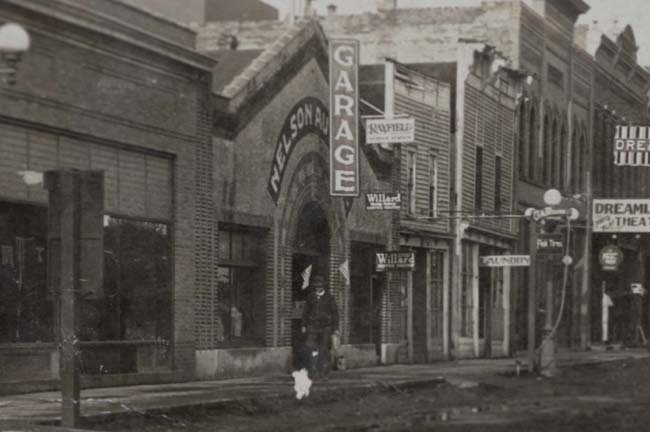 It was just as likely, though, that storage of the family auto would have been outsourced to a garage such as is shown here in downtown Benson: the car was stored, serviced, and isolated from domestic life, until such time as it was needed and delivered by someone acting very much as a valet. What were the costs of such service, I wonder? Somewhere in the unstructured blog there is a similar facility for the storage and care of horses—which became Equus & Co.—and might easily have morphed into the comparable facility for cars. Why do I seem to have such a talent for explaining the obvious? And taking a measure of pride in doing so? Sorry about that. By agincourtiowa in Uncategorized on Friday/14/December/2018 .